FOUND!! Love Wins Out!! What This Blog Is All About!! Home→FOUND→FOUND!! Love Wins Out!! What This Blog Is All About!! Greg was not the only one looking for this You Are My Sunshine yellow elephant. Try as I might, I wasn’t able to locate one, or even a picture of one. But one of our readers, Janice, let me know there was one on eBay, and, after quite a bidding war, he won it!! He posted this heart wrenching story as a comment on a previous search request here on Plush Memories, but I just couldn’t leave such a story buried in the comments! This must have been some Elephant! My wonderful girlfriend, and soul mate, told me stories about her Elephant (which is identical to the one you’re looking for) She got hers from her father as she was torn from him arms in Saudi Arabia (she’s American) Her and her mother spent some time in Saudi custody before the American Embassy stepped in and had them sent back to America. The trauma was too much for her mother and my girlfriend was eventually put into an orphanage where she was separated from the only thing she had left to remember her family (her elephant). She got a letter when she was 15 telling her that her father in Saudi desperately wanted to come to her, but was killed in the process. She cries when she talks about it, and she’s pretty much come to terms with the fact that she’ll never see him or her elephant again. If I can find an elephant like this one, my plan is to tie an engagement ring on a ribbon around it’s neck and give it to her. It’s very symbolic of “family” to her and I think would be the perfect way to tell her I want to spend forever with her and start a family with her. If anyone can help me locate this elephant it could help a beautiful young girl get some closure to a horrible childhood, and could help me give her a feeling of security for the future! Please help! The elephant was yellow, had pink inside the ears, sang “You Are My Sunshine,” and the head softly moved while it was playing. I believe it was made by Eden. Thank you so very much! Hopefully, Janice will check back to see if he won it, as I have no way to contact her. I’m sure Greg would want to send her a Thank You email, himself!! I’ve asked Greg to tell us about how she reacts when he proposes to her with the Sunshine Elephant, and I’ll be adding to this post then. Just an update! 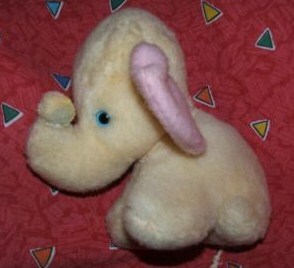 I received the Elephant, in authentic worn condition, works great and it is the sweetest little thing! I’m having a jeweler friend help me make a “daisy” engagement ring for me out of Black Opals. My plan is to have the ring tied with ribbon around the elephants neck under the Christmas tree! Let’s hope everything else falls into place and the jeweler can get the ring done in time! Thank you SOO much everyone who helped out, this is such a great situation and it warms my heart to know there are people out there that are willing to help. This is a GREAT service and I’m going to visit regularly and keep my eyes open and maybe one day I’ll be able to return the favor. I have a tear in my eye, thank you everyone! You’re not the only one with a tear in your eye, Greg. Thanks for keeping us posted! I got my engagement ring on Christmas, too, and still have the huge box he hid it inside. This is a great story! While the teaser is not exactly accurate in the Surfer’s Paradise Hullabaloo! Carnival I thought it would help people understand what this is about upon arrival. Thanks a ton for helping make the carnival a success! We have not been able to help everyone who has asked for help, but sometimes we get lucky. I had 2 emails yesterday, thanking me for finding the exact toy they were looking for. It just makes my day!! And it spurs me on to keep looking and keep posting more of these great stories! Thanks for the chance to spread the word about our Search Service through your HULLABALOO Carnival, Anthony!!! well, now Greg could possibly say he bought an elephant on ebay! Yep, he did buy an elephant on eBay!! And he’s warmed my heart, and everyone who reads this story, too!! Thanks for stopping by, Jay Cam.